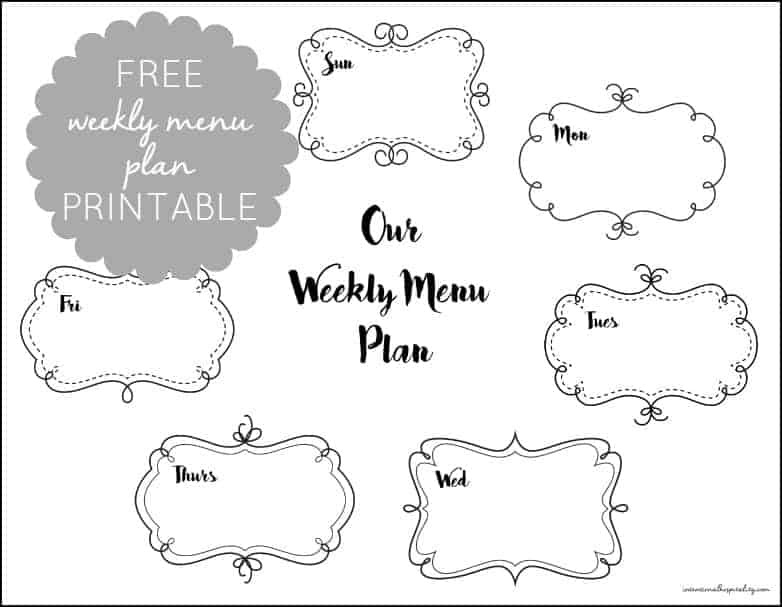 Planning a menu can be easy and help save you money and time with a few basic tips and this free weekly menu plan printable. You know how it is, heading home after a long day and you start thinking what should I fix for dinner. Tired and exhausted you realize everything that sounds good you will have to stop at the store to pick up ingredients for. At that point, it’s just easier to pick up take out. Not a bad idea but that $20 dinner can add up if you do this very often. To help make your dinner time plans go smooth next week why not try these few tips to help you create a menu plan for your family dinners. No more filling up your time with last minute stops at the store or spending extra money on buying items, not on sale or take out dinners. Start by picking one time each week to sit down and plan your menu. 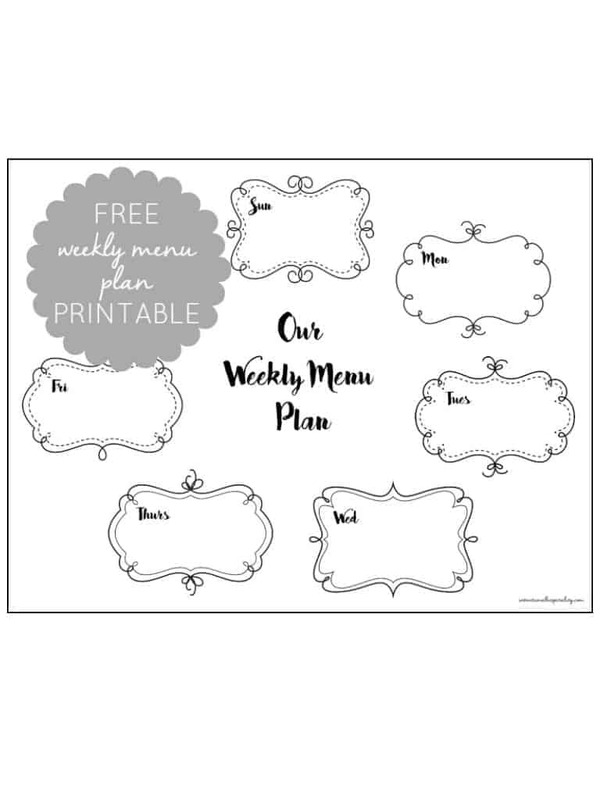 Have a pad of paper for making a grocery list, some cookbooks or recipe cards and this free weekly menu plan printable. It might also be fun to start a Pinterest board, pinning new ideas of dishes you would like to try. Don’t overwhelm yourself, trying to create a month of dinners all at one time. Start with one week, learning to tweak your system as you go. Ask everyone to suggest one meal that they would enjoy having on the menu. This helps you, and nobody can complain that they didn’t get something they liked that week. Gather all your recipes in a stack and see what you already have on hand. Gather all your recipes, going through each one to see what ingredients you might already have on hand. No need to buy something you already have. If you have a few nights on your menu that you are not sure what to fix, try looking at your sales ads for good deals. If chicken is on sale, try something like my Low Carb Chicken Florentine. Next, go through your store’s sales ads. I usually shop at two different stores, picking up only the sale items mostly. We are huge Aldies fans so anything not on sale we go to Aldies and purchase. Create a grocery list. I like to write mine in categories such as dairy, meat, produce, canned/boxed and so forth. This helps me get through the store quickly, as I mark off each item I put in the cart. If someone gets home before you, there is no question as to what is for dinner. They could start frying hamburger, cutting up vegetables or put rice in the rice cooker. This will also help you each evening after dinner prepare for the next meal by glancing at the menu and pulling items out of the freezer to defrost overnight in your refrigerator. Menu planning is a great way to save money, time and help you have a relaxed evening after a long day. 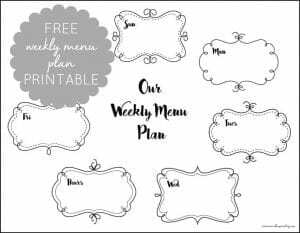 To receive your own Free Weekly Menu Plan Printable just click the image below, join my email newsletter and I’ll send you a link to download your own PDF copy for free. Click image to JOIN and RECEIVE your own PDF Weekly Menu download.